Herbs, perennial, rhizomatous. Culms solitary or close together, trigonous, 5-40(-95) cm, glabrous. Leaves (2-)3-7, broadly V-shaped, 3-20(-30) cm × 1.5-3 mm. Inflorescences: spikes loosely to densely ovoid to hemispheric, 7-16 mm diam. 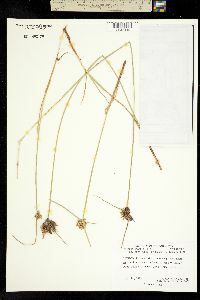 ; rachis 1-2 mm, or absent; rays 1-2, 3-45 mm; if rays absent, inflorescence sessile, dense, 6-20 mm diam; bracts 2-3, horizontal to reflexed downward, broadly V-shaped, 1-15 cm × 1-3 mm. Spikelets (3-)5-25(-60), linear to oblong-linear, (3-)5-9 × 1.8-2.3 mm; floral scales 4-18, closely imbricate, chestnut brown, black, or brown, medially green or greenish brown, laterally ribless, medially 2(-3)-ribbed, distinctly 2-keeled basally, ovate to orbiculate, 1.5-2.1 × 1.4-2.2 mm, apex obtuse. Flowers: stamens 2; anthers 0.6-0.8 mm, connectives not prolonged; styles 0.4-0.6 mm; stigmas 0.7-2.1 mm. Achenes brown, ellipsoid, 1.2-1.4 × 0.6-0.8 mm, network of ridges forming isodiametric or square cells, slightly stipitate, apex apiculate, surfaces minutely punctate. Fruiting summer. Swamps, ditches, wet pastures, seeps in montane forests; 0-1200 m; Ariz., Calif., N.Mex., Okla., Tex. ; Mexico; Central America; South America. 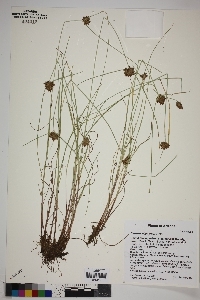 Six varieties (Cyperus niger var. niger, var. castaneus, var. robustus, var. lorentizianus, var. intricate-ramosus, and var. pseudo-elegantulus) were recognized by G. Kükenthal (1935-1936). Based on field observations and measurements of hundreds of collections from Mexico, where the species is most plentiful, it does not seem possible to recognize any of the infraspecific taxa (G. C. Tucker 1983, 1994; G. C. Tucker and R. McVaugh 1993).